In a nutshell: Lovely cakes at exorbitant prices. 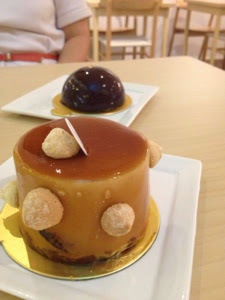 The tiramisu cake left me slightly tickled with wobbly coffee gelee exterior that tasted like a konnkayu bubble. Still prefer Da Paolo Gastonomia's version though. Signature G Spot chocolate cake was well executed with punchy notes of rich dark chocolate mousse and crunchy hazelnut. However the hefty $10 price tag left me a little wanting. Pity I don't drink coffee. Heard they serve mean javas with fanciful froths. All in all.. A costly experience to be savoured occasionally.